The number of people on food stamps jumped 14.7% from 2009 to an astounding 43,200,878 people. In one month participation increased 0.7%. There were 310,570,000 people in the United States in October. That is 13.9% of Americans on food stamps for October 2010! The average benefit is $133.79 per person. 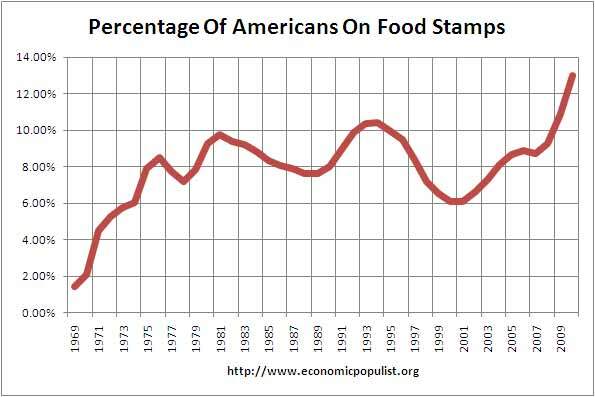 The graph above shows the dramatic rise in food stamp usage. The graph was created from annualized historical food stamp data and normalized to the total United States population, including the armed forces overseas, annualized. The food stamp participants were also annualized by their yearly average. The government now calls this program SNAP instead of food stamps. Wow, talk about bailouts. I wonder when all these people getting a fee ride are going to start paying back the taxpayers for this bailout. Should we let people starve? Would you like hunger and famine over not having money next? What is wrong with some of you people? Don't you realize you could need food stamps and your neighbor is probably having to use food stamps? Hey Robert - It is too easy to say "Gimme". You feed them. When your kids are starving and dying from hunger, I'll be sure to keep you in my thoughts. Get a clue jackass, this isn't a "gimmie", you can only get food stamps when you are completely flat broke and as it is, people go hungry because food stamps not enough. Maybe you aren't paying attention to food banks running dry or the statistics on hunger in the United States, which show people are literally going hungry and I'm so glad someone wants to return to starvation as a way to curtail the population of the poor. Look let them eat cake, you are really out of reality on what is going on in America and probably this is the cruelest comment coming from an anonymous coward I've seen on this site in a long time. Sure is a good thing we have you to set us straight. The "pull yourself up by your bootstrap" folk always squeal the loudest when its handout time. Remember the TARP crying? Don't let them get under your skin. Besides with the stimulative effects of Food Stamps they pay for themselves. Dead people don't contribute to society or pay taxes. Unfortunately, as we see, not all the living contribute either. Over the last 20 years it seems that more has been done to decrease a person's marketability for employment than promote it. You have background checks, credit checks. Employers can easily commit age discrimination during the background process because we have to submit our date of birth and social security number. The mere existence of these entities represents poor leadership in Washington. Get rid of these entities and some of us would not need any food stamps or other public assistance. Convicts get out of prison and are expected to rehabilitate themselves back into society. How can a convict achieve such status when he/she can't pass a stupid background check? You want people to be able to get a job. In turn you build the economy and social security fund. The politicians don’t care about this because taking action on these matters doesn’t promote their political future. Other such entities contributing to poverty and homelessness is the federalized abusive wage garnishing child support system. This system garnishes the wages of low income Americans, snatches our tax returns and stimulus checks, turns parents into criminals. Parents are not criminals! When the government garnishes our pay they control our finances, our personal economy and lastly, our lives. This system represents an abuse of power. The feds have over stepped their boundaries. Tax payers hollering about child support not being paid. Well, what about your tax dollars going into the corrections industry? An astronomical amount of tax payer money is attributed towards the corrections industry. It’s estimated that it cost $30k per annum to care for an inmate. More than two thirds of every state’s budget is attributed towards the corrections industry. How much of our tax dollars are attributed towards the federal corrections industry? It only gets worst. I’ve often heard that the politicians only understand suicide and violence. i am on food stamps, my husband is a hard worker and got laid off cuz of the economic downfall. my mom was a manager for the des office the whole time i was growing up. you think i wana be on food stamps. you think i dont get tired of ramon and pband j ugh man some ppl. yes some ppl take advantage of it but not all people get real. its humiliating to have to go to welfare and pay for my food with food stamps to not be able to buy cookies for my kids school party. i hate it! i dont wana be on stamps and my husband and i are beating the pavement everyday to try and find work to be able to change our lives.